Friends have asked me, “How can you be so sure that the Bible is true”? I would answer them that Bible Prophecy is one sure-fire way to tell that the Bible is true. There are many prophecies contained within the Bible that have already been fulfilled, which gives me great confidence that the remaining ones will also be fulfilled in God’s perfect timing! Only God can predict the future with 100% accuracy. I tend to believe that Bible Prophecy (prediction of future events) is in place to warn people, to prepare people, and to show that YHWH really is Lord over all the earth. Tradition holds that the book of Daniel was written by Daniel himself during the Babylonian Exile in the 6th century BCE. Some skeptics think that the book of Daniel was written much later, during the Maccabbean revolt in 165BCE, because it has been so amazingly accurate in predicting world events. Often there is a hermeneutical presupposition against predictive (prophetic) writing. This basically means that some “scholars” have a difficult time imagining that God could have or would have divulged this level of detailed information to an Old Testament Prophet, who then wrote it on scrolls. However, there is significant evidence indicating that Daniel was indeed penned by Daniel himself in the 6th century BCE, and NOT hundreds of years later, during the Maccabbean revolt, as many skeptics maintain. This is important because it speaks to Daniel’s predictive prophecies that have already been fulfilled and shows yet again that YHWH Elohim is Lord over all the earth. 2. Linguistic Evidence: Aramaic: Daniel’s Aramaic demonstrates grammatical evidences for an early date more closely associated with the seventh and sixth centuries B.C. than with the second century B.C.14. Scholars who believe that the book of Daniel was written later, around 165BCE during the Maccabbean revolt do not see Daniel as a Prophet, but only as someone who was trying to encourage the Jewish remnant in Babylon during the Diaspora (Jewish exile into Babylon). However, these “Christian” scholars ignore the fact that Jesus, Himself, in the New Testament, identifies Daniel as a Prophet (Matthew 24:15)! What we’re basically saying is that skeptics will always be skeptics; however, there are MANY Biblical scholars who BELIEVE strongly that the EVIDENCE REVEALS the Prophetic book of Daniel was written by Daniel, himself during the Babylonian Exile in the 6th century BCE. This is significant, because Daniel prophesied of World Kingdoms that would come and go, and his prophecies HAVE PROVEN 100% accurate! The book of Daniel basically runs through every major Kingdom on the earth all the way up to the final Kingdom of man, the Beast Kingdom that we now believe is the New World Order. Ultimately, this final man-made Kingdom will be destroyed by God Himself when His Son Jesus returns to set up His Divine Kingdom on earth! To quote the Lord’s Prayer taught by Jesus, Himself….”Thy Kingdom Come, Thy Will be done on earth as it is in Heaven”! Daniel is written in what is known as “apocalyptic literature”. This type of literature is a literary genre that not only describes the current and future kingdoms of the world, but also foretells the cataclysmic events that will occur at the end of the age and the 2nd coming of Jesus the Christ. Some people are intimidated by this type of Literature, or believe that you have to be some type of scholar to understand it! Don’t be intimidated!!! God has given BELIEVERS in YESHUA (Jesus) HIS HOLY SPIRIT to lead us into all truth!!! Holy Spirit is literally our teacher and guide!!! Apocalyptic literature simply utilizes symbolism, parables, and what some describe as esoteric language (language that requires interpretation) to reveal to us what has not yet taken place. The word apocalypse ( Ancient Greek: ἀποκάλυψις apokálypsis, from ἀπό and καλύπτω, literally means “an uncovering”) and is a disclosure of knowledge or revelation. The final book of the Bible, the book of Revelation, is also written in apocalyptic language and is considered to be a “sister book” to the book of Daniel. The imagery in both books is very similar! It’s important to note that Daniel is an Old Testament book written in 600BCE, hundreds of years before Jesus’ first coming and Revelation is a New Testament book written by the Apostle John in about 96AD, or about 25 years after the destruction of Jerusalem and the 2nd Temple that occurred in 70AD. Although Daniel wrote in symbolic, apocalyptic language, his writings depicted the rise and fall of literal earthly Kingdoms. Actually, much of what Daniel wrote about in the 6th century BCE has already been fulfilled, or at least the “foreshadow” has already been fulfilled. However, we have to stay tuned, because there is more yet to come. In the 2nd chapter of Daniel (Daniel 2), the King of Babylon, Nebuchadnezzar, was given a very significant dream from the Lord YHWH. To be clear, King Nebuchadnezzar was a Babylonian and did NOT worship the God of Israel; however, YHWH can use whomever He wants to use to accomplish His Divine Purposes. Nebuchadnezzar was greatly disturbed by this dream and he wanted to know the interpretation. It literally haunted him, and he asked all of his magicians and wise men to give him the interpretation. But Nebuchadnezzar was no “dummie”. He knew that his wise men would lie, or make up a story, so he first had them describe to him the actual dream and then give him the interpretation. The magicians argued that nobody on earth could do that. But Nebuchadnezzar heard about a young teenage Hebrew boy that had been taken captive from Jerusalem and was forced to serve in the Babylonian King’s court. This boy, Daniel, was known to be an excellent interpreter of dreams. The king summoned the boy (Daniel) and asked him the same question. Daniel prayed for the answer, and then returned to the King. Daniel told the King that no man on earth could tell the King his dream and the interpretation, HOWEVER there is a GOD IN HEAVEN who reveals mysteries, and could reveal the dream and the interpretation. Daniel then told the King what YHWH had revealed to him. Daniel 2: 1 “You, O king, were looking and behold, there was a single great statue; that statue, which was large and of extraordinary splendor, was standing in front of you, and its appearance was awesome. 32 The head of that statue was made of fine gold, its breast and its arms of silver, its belly and its thighs of bronze, 33 its legs of iron, its feet partly of iron and partly of clay. 34 You continued looking until a stone was cut out without hands, and it struck the statue on its feet of iron and clay and crushed them. 35 Then the iron, the clay, the bronze, the silver and the gold were crushed all at the same time and became like chaff from the summer threshing floors; and the wind carried them away so that not a trace of them was found. But the stone that struck the statue became a great mountain and filled the whole earth. Daniel 2: 36 “This was the dream; now we will tell its interpretation before the king. 37 You, O king, are the king of kings, to whom the God of heaven has given the kingdom, the power, the strength and the glory; 38 and wherever the sons of men dwell, or the beasts of the field, or the birds of the sky, He has given them into your hand and has caused you to rule over them all. You are the head of gold. Daniel 2: 39 After you there will arise another kingdom inferior to you, then another third kingdom of bronze, which will rule over all the earth. Daniel 2: 40 Then there will be a fourth kingdom as strong as iron; inasmuch as iron crushes and shatters all things, so, like iron that breaks in pieces, it will crush and break all these in pieces. 41 In that you saw the feet and toes, partly of potter’s clay and partly of iron, it will be a divided kingdom; but it will have in it the toughness of iron, inasmuch as you saw the iron mixed with common clay. 42 As the toes of the feet were partly of iron and partly of pottery, so some of the kingdom will be strong and part of it will be brittle. 43 And in that you saw the iron mixed with common clay, they will combine with one another in the seed of men; but they will not adhere to one another, even as iron does not combine with pottery. Daniel basically told the King that the Babylonian Kingdom is the head of Gold. Babylon was the world power at the time of Daniel, in the 6th century BCE. But, Babylon would not endure forever. The King is then told that there will be another kingdom or world power that would come along, and after that a 3rd Kingdom. Through additional dreams and visions revealed within the book of Daniel, scholars are very certain that these Kingdoms include Babylon (head of gold), Media Persia (breastplate of silver), Greece (Alexander the Great/Belly of Bronze), and Rome (the 4th Kingdom that crushed the whole earth – the legs of the Statue). REMARKABLE that God revealed all of this through his prophet Daniel LONG BEFORE most of these kingdoms came into power! Revelation 17: 12 The ten horns which you saw are ten kings who have not yet received a kingdom, but they receive authority as kings with the beast for one hour. 13 These have one purpose, and they give their power and authority to the beast. Daniel 7:7: After this I kept looking in the night visions, and behold, a fourth beast, dreadful and terrifying and extremely strong; and it had large iron teeth. It devoured and crushed and trampled down the remainder with its feet; and it was different from all the beasts that were before it, and it had ten horns. The good news is that this beast kingdom with 10 horns will have authority on earth a total of only 3.5 years. “In the days of those kings (the Divided Kingdom/New World Order), the God of Heaven will set up a Kingdom which will never be destroyed and it will crush and put an end to all of these kingdoms, but God’s Kingdom will endure forever. This is the fate of man’s literal Kingdoms on earth. In our previous post, we showed that God gave man 6 days to “go his own way”, and the 7th day, the Sabbath day of rest, belongs to the Lord. God gave mankind 6000 years to go his own way, but the final 1000 years, the Millennial Reign of Jesus’ Kingdom on earth, a time of rest for mankind, belongs to the LORD. So far, the prophecies of Daniel have proven completely accurate and true regarding Babylon, Media Persia, Greece (Alexander the Great and his 4 Generals), and Rome. Because these prophecies of EARTHLY KINGDOMS were fulfilled exactly as written, there is no doubt that there will soon be a literal earthly kingdom (a divided kingdom) that is partly weak and partly strong, that is ruled (possibly behind the scenes) by 10 global leaders, and that will tear down the entire earth for 3.5 years. We can see the build up to this “Beast Kingdom” even as we speak! Global leaders call this “kingdom” the NEW WORLD ORDER. We did a previous post about this, showing that the global elite have been building towards this “kingdom” for decades. You might even be surprised to learn that the United Nations have already partitioned the world up into 10 regions. This global government is being driven by the same spirit that has always been in the air, the spirit that drove the building of the Tower of Babel. This is the nasty fruit from the tree of the knowledge of good and evil, the idea that the entire world can rule themselves totally WITHOUT YHWH. Although this WILL CONTINUE TO BE touted as a good and benevolent “kingdom”, make no mistake, this final kingdom, this NEW WORLD ORDER will be VERY EVIL and will be headed by two individuals we know as the anti-christ and the false prophet (Revelation). We’ll discuss these two individuals in another post, but JESUS, the LION OF THE TRIBE OF JUDAH, will CRUSH this Kingdom and set up His Glorious Kingdom that will have no end. Hallelujah!!! You think this is not possible? So much of Daniel has already been fulfilled, and we are BARRELING towards the FINAL FULFILLMENT very, very soon! Open your eyes and look around. It’s already happening…. The concept of Sustainable Development basically says that there are too many people on planet Earth and that the population of the world must be reduced in order to have enough resources for future generations. [Under the New World Order plan,] the UN should be the global custodian of the Earth and all of its resources. This means that we will be measured by how much we produce and how much we consume as found in the “family dependency ratio.” Every person will be valued according to their usefulness. In addition, the UN will control the Earth’s resources – energy, water, food and so on. The concept of Sustainable Development can be found in the Communisto Manifesto and the 1977 USSR Constitution. – Joan M. Veon,The Women’s International Media Group, Inc. The UN has already divided the world into 10 regions…. 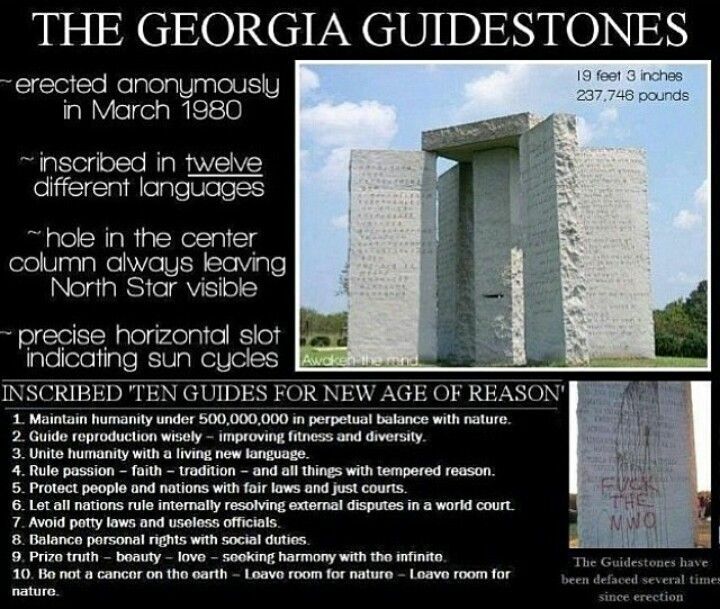 Have you seen the Georgia Guidestones? Think about it! The first “commandment” is to maintain Global population under 500 Million! There are currently over 7 BILLION people on this planet!